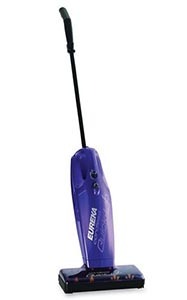 Eureka’s 96B Quick Up Cordless Vacuum appears to be billed as a stick vacuum, but going by photos I have a sneaking suspicion that it’s more of a handheld that happens to be able to be used as a stick. That could have some very practical implications about its power and performance – let’s see what Eureka’s actually giving us. The Quick Up only has six volts for power. That’s…well, not very much at all – it’s enough to work, and it’s quiet at least, but it’s definitely on the lighter side, even for a handheld. Oddly enough, both for something with a handheld and something with only six volts of power, the Quick Up has a brushroll. It doesn’t really help the vacuum with carpet like brushrolls are generally for, because that’s just too little power to really do carpet at all. That said, this vacuum does do a pretty good job on bare floors with common messes like cat litter, crumbs, and light amounts of hair. The Quick Up is at least able to stand on its own without falling over, and you can turn off the brushroll if you’d like. Unfortunately, both that and the Quick Up’s on/off switch are all the way down on the body of the vacuum, because the part that makes it a 2-in-1 vacuum, the stick, is just that: a stick. Moreover, if you want to just use the handheld without the stick, the longer handle is anything but one-touch, easy-to-remove. Eureka doesn’t say exactly what kind of battery they’ve chosen for this vacuum, but given that it seems to need about a day to fully charge, it’s probably a NiCad. That kind of battery also makes sense for this vacuum’s price range, and it gives a runtime of a little under ten minutes if you keep the brushroll turned off, which is okay for a handheld. The stick doesn’t really add any weight to the Quick Up, really, so it is easy to carry – it’s only four pounds. This vacuum comes with the traditional papery-fabric cup. It works well enough, but needs to be emptied almost every time to make sure the vacuum continues to perform. The Quick Up’s dust bin is actually a pretty decent size, and also is available in several bright colors. Interestingly, while this vacuum does have a handheld aspect with the unusual feature of a brushroll, it doesn’t have the common accessories that come with a handheld. It can, however, be bought in packages with an extra battery or extra filter. Aside from the chance of a faulty battery that comes with all NiCad batteries (of which we’re still assuming this vacuum has based on what evidence we have), Eureka’s construction seems to hold up pretty well. The Quick Up is cheap in cost but at least well made. The one year limited warranty that comes with this vacuum is less than the average of two years, but it’s reasonable for the Quick Up’s price range. This vacuum’s price is one of its strongest selling points. I know that sounds harsh, but it’s actually something to consider clearly – if you don’t want to spend too much for very basic messes, this is what you’re looking for. The Quick Up is admittedly not one of the better vacuums I’ve reviewed. It’s a little bit of an odd design – it has the would-be pluses of brushroll and supposed 2-in-1 capability, but it doesn’t have the power or convenience to back them up. That said, if you just need to clean stray litter, dust, and crumbs, there’s really no need to empty your wallet – you can save and have serviceable cleaning with the affordable Quick Up.